Moho Forum • View topic - Clipstudio Paint Pro and EX English/Spanish/French released! Rejoice! It is here, and sports animation! And a 60% off deal which gets you Pro for $20, and EX for $87! 1. Their vector layer has a great set of inking and cleanup tools. Also vector layers can be used for animation cells! 2. Animation cells can be re-used in the timeline. Both tvpaint and krita can only copy and paste cells, but not instance and assign them the way clip paint can. That makes it better at animation re-use. 3. Their licensing fees are much much cheaper than TVPAINT (49$ vs 800^$) - that makes them a serious competitor now that they released this to international market. Also known as frame-by-frame or traditional animation, this technique makes an object or character appear to move on its own. The artist can draw individual cels (frames), which act as transparent sheets that can be layered, and create the illusion of movement when the series of cels is played as a continuous sequence. This feature provides granular control over timing and display adjustments to create fluid movement of the animations. The light table illuminates pages, rendering them semi-transparent and making it easier to use multiple layers for reference, which is ideal for creating in-betweens (transitions between cels), and clean-line art for cels and illustrations. Onion skinning is a technique used in creating animated cartoons and editing movies to see several cels at once, allowing the animator or editor to determine how to create or adjust an image based on the previous image in the sequence. Drawings and animations can be exported as sequential images, GIFs, and movie formats. Do you have any video demonstrations of the animation feature? I'm curious how this compares to Cacani and TVpaint. I would love to see an integration of the two programs. Where AS has a CPP layer and CPP would have two layers from AS on vector and one image. Anything done in Clipstudio would show up as a dedicated sequence image layer in ASP. And anything in ASP would show up as sequence vector and sequence image layers in Clipstudio. This setup would be a big draw on the memory of the computer so control of what and how many frames would be integrated would be needed. But if AS can auto up date image files and it dose now, this is not that impossible. Duey, do you own a copy of this program? If you do, could you make a video showing how the animation and vector art works? I'd like to see how animation instancing and vector art works in this before I consider buying a copy. dkwroot wrote: Duey, do you own a copy of this program? If you do, could you make a video showing how the animation and vector art works? I'd like to see how animation instancing and vector art works in this before I consider buying a copy. I own only the junior version. No animation. I think animation is new to the program. I don't remember it being part of the program before. At 87 dollars I might get the program. But right now I'm going to be putting in a 20 hour and a 16 hour shift at work. I have little time to myself. Doesn't anyone want to work the weekends any more? Finally found a video that shows the new animation feature. Animation starts about 22mins in. Last edited by synthsin75 on Sat Mar 19, 2016 6:03 am, edited 1 time in total. I don't know about you guys, but the animation workflow looks odd to me. They focus way too much on ordering everything in the layer panel that they barely touch on what the timeline can do. Maybe it's because i come from a Flash background that I find this strange, but it looks needlessly complicated. The fact that everything was written in Japanese didn't help either. Perhaps it looks needlessly traditional. Doesn't seem to have any tweening or multiple frame coloring aids. Just straight forward frame by frame. In the video, they treat every frame like a group and they have layer ordering within each group. Photoshop does this too with tracks and it's a huge pain to work with. I don't like that this appears to create a dependency on the layer manager. Why they didn't consolidate everything to just the timeline and use the hierarchy of several timelines to control layer order is beyond me. That is how Flash and Cacani handle animation and it's also the direction Krita is going. This still looks cool, but I'll probably pass on it. Right, I have been playing around with the timeline and animation options, and here are some of my conclusions so far. First, I have not worked with a similar timeline before in other animation applications. It is plain different, and has its good and bad points. First, this is a pure frame-by-frame animation timeline: no automatic tweening in sight. Second, the animation timeline in the PRO version is limited to a mere 24 frames length. The EX version is required to remove this limitation. The workflow, once figured out, is actually really simple, and quite effective. 5) the timeline supports the standard operations, such as dragging and dropping, (drag)selecting frames, copying, pasting, and so on. It is also possible to start a new animation project, which can be divided into stories, scenes, timelines, cuts, and so on. 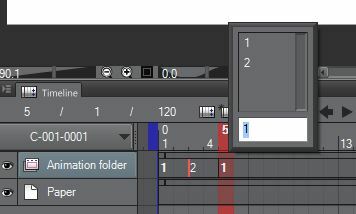 An option for timelines to be named automatically according to scene and cut name is also available, as is managing all the files by using folders in the project. This is actually quite nice, I think. Being able to quickly group layers in the animation groups and maintaining cell name integrity is also quite nice. And I do like being able to do whatever I want in a cell group. It's easy to layer a cell quickly. I also like being able to drag in the view with the timeline tool to scrub through the animation. Another handy feature is the Animation Cels panel, which allows for comparing/use a light table for any frame. So two entirely separate frames can be compared easily, and used for drawing reference. Clips are also available in the timeline, and easy to work with. Time stretching, for example, exists as an option. Initially I thought having all those frames in the vertical layer stack would be a pain to work with, but it actually works quite well, much to my surprise. The timeline scrubber controls which layer is selected, so it is not difficult at all to locate a particular cel in the layers. The layer search dialog allows for quick filtering of particular layer types, which include animation folders and animation cels. I had success importing an Anime Studio rendered uncompressed AVI file in the timeline. No sound support! No ability to import sound in the timeline is a fairly serious omission, in my opinion. At least, I could not find an option to do this. My attempt to load up an AVI file with sound failed. The onion skinning in TVPaint and Krita is easier to control, and offers more control. I am not saying the onion skinning in CS is bad - not at all. Quite good, but I still prefer the control I have in the other apps. Other things are missing as well: for example, I could find no way to reuse a cel in the timeline, and just re-position it. It will re-position all the cels in the timeline. Perhaps it is possible, but I could not figure out how to do this. If not possible, I feel this hampers the workflow a lot. Sub/child-animations which are re-usable across the timeline is another option missing in action. This is pure frame by frame animation: and the things which seem to be oddly missing in CS, are readily explainable after realizing another animation product exists: ClipStudio ACTION. These two work in tandem, and ACTION does include camera control, sound, and tweening. The Japanese site explains these two are supposed to work together. Seen in this light it starts to make more sense: Clipstudio Paint EX is meant for traditional 2d frame by frame animation. It does a pretty good job in my opinion. The one thing I really miss is sound import. As a happy TVPaint user I don't have any need for just another FBF program. But right now several of those seem to appear everywhere: Krita, Cacani, Clipstudio, and since this week Toonz as an open source version. I can see this can be confusing especially for beginners. And I can foresee new AS users asking "why doesn't this work like in [software X], which is the superior and only way to do this". I have this program and been experimenting on my own to get it to work. I found out that they forgot to include a English version of the new update feature. In order to import sequence images from another program, you first need to create a new animation folder in the timeline, and then highlight that folder before importing all the sequence images. To make it easy to import, I would suggest to make a folder and then render all the images to that folder starting with "1" So that when you import it to Clip Studio, it will make it easier to set numbers to all the frame accordingly. It does support onion skin for pre and post frame. It does not allow to copy paste drawing from one frame to another. I had to drag the frame out of the animation folder to copy and paste to a new frame, and then bring back both item to the new animation folder. However any frame that is un-change for several frame could be set for the number of frame by dragging the frame timeline out. You can not animate object in the frame over the timeline. It's pure Frame by Frame. Have anyone look at Toon Boom Storyboard program? Most of us are looking at the new timeline added feature and think about the animation, but not too many consider this to be a great storyboarding program! They do need to add sound import to make this complete. herbert123 wrote: Other things are missing as well: for example, I could find no way to reuse a cel in the timeline, and just re-position it. It will re-position all the cels in the timeline. Perhaps it is possible, but I could not figure out how to do this. If not possible, I feel this hampers the workflow a lot. If you duplicate a cell in the layers palette it will create a letter copy (2 duplicated becomes 2a) and then you can choose to use and transform 2a without it changing 2. Thanks for the headsup on the Animations Cell palette for showing non sequence cells in the onion skin! I had wondered about this but couldn't figure it out... the documentation (in english at least) seems to be lacking! Yes, I am aware how a frame can be duplicated. What I mean is an option to transform the content of existing cels for re-use in the timeline, and when the source is changed, the copies update automatically. For example, suppose we'd like to copy a blinking eye to the other side of the face, and then reposition and transform it. Later, when we want or need to change the original, the duplicate updates as well. A bit like symbols in Flash. I have been unable to discover whether this is possible or not. Seems like a no-brainer to me in frame-by-frame animation: re-using as much as possible. herbert123 wrote: Yes, I am aware how a frame can be duplicated. What I mean is an option to transform the content of existing cels for re-use in the timeline, and when the source is changed, the copies update automatically. Create a new blank cel then right click the cel in the timeline and choose the frame you want to call on instead... when you edit that frame anywhere on the timeline it will update anyplace else you called on it. If you're talking about transforming, like scale, flip or rotate in a non-destructive manner then I don't think you can since all this does is call on the cel. How often will you animate perfect symmetry to warrant something like this anyway? I've seen CSP getting a lot of flak about not having a Flash or TB style symbol library for reuse or auto-tweening on social media but in frame by frame you only really reuse certain cels or entire cuts to do ticktock animation like waving or scatter the cels to change the energy. Goku from DragonBall can have two fights in the same episode, you can reuse the same cut 2 times such as a rapid punches cut made up of just 3 unique frames, but each time you use the cut you can change the order of the frames, 1a uses 1,3,2,1,2,1,3,2 and 1b uses 3,1,2,1,2,1,3,1, so the viewer doesn't get bored. CSP isn't Flash, it does what you would do on paper. Since it is superseding Retas Studio that should give people an idea. If you break this down how many individual frames are there? But they don't play in the same sequence. Using a symbol approach for symmetrical drawing is just too mechanical for frame by frame animation, easier to just draw what you want, you'll have more control. If you're animating objects and special fx, then those can be exported as assets and then composited later in Toonz, AE or Fusion and edited in some cases like a Flash symbol.